With vast industrial experience, we are involved in offering a wide range of HVAC Collar Damper. Dampers (for Grills and Diffusers ) the opposed bladed dampers required to regulate the air volume that can be operated form the face of the grills / diffusers with simple M.S.Key. (Also available in G.I. & M.S. construction. We are one of the most reliable companies in this domain and are into offering Collar Damper. We are involved in manufacturing, supplying and exporting a wide assortment of Collar Dampers. These Collar Dampers are highly durable in nature and available in market in various sizes. 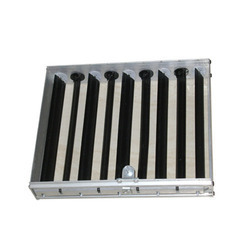 Further, the Collar Dampers is frequently used for the same purpose in slot and linear diffusers. 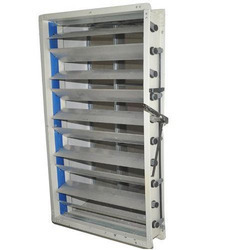 Key type Dampers is used for air volume control behind grilles and diffusers to suit the air conditioning requirements of the designated areas as per the design. They are available in two types of construction, namely; Aluminum and Mild steel both of them work on opposed blade construction. Grille Collar Damper Aluminum The opposed blade damper is available in a rangeofsi7estoregulatetheairvolumeat individual grille/difusers from fully open to close. For the diverse requirements of our clients, we are engaged in offering a quality range of Collar Dampers. The complete range of our products is made up of premium grade base material bought by the trust able dealers of the industry. These products are sturdily constructed and offer hurdle-free performance with speedy results. We are prominent names in the industry in offering a wide range of Collar Dampers. Owing to their excellent corrosion resistance properties, these products are highly demanded.